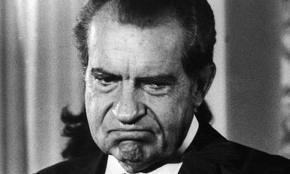 Photo of Richard Nixon, scowling. When I was eleven years old I fell onto a pricker bush. It’s hard to say how I did it, but I was impaled on hundreds of thorns. My sister who was six at the time, and my cousin Jim who was maybe nine, fell to the ground laughing as if they might die. I begged them for help which of course only made them laugh all the harder. I remember tears welling in my eyes and their insensible joy. I also knew in that moment they were right to laugh—that I was the older kid, was a bit bossy, disability be damned. I was the one who told my sister and cousin what to do. Now I was getting mine. My just deserts. In the end I tore myself from the monster shrub and stormed into the house. I sulked while they continued laughing outside. Now sulking is an interesting thing. The word comes from the mid 18th century, from the obsolete word “sulke” which means “hard to dispose of” and is of unknown origin. In general I love words that have unknown origins. The verb “to sulk” means “to be silent, morose, and bad-tempered out of annoyance or disappointment.” The most famous instance of sulking in literature is in opening of The Iliad where we see Achilles sulking in his tent, refusing to fight with the rest of the Greeks. In America where there’s a lot of sulking, perhaps the most famous sulker of all was Richard Nixon, who said in a press conference after losing the gubernatorial election in California that “you won’t have Nixon to kick around any more”. If you’re a sulker you can’t deliver the Gettysburg Address. In this way, successful sulkers know the cave of hard dispositions must be visited but only for the briefest of repairs—like a toilet on a moving train. At eleven I pulled those damned prickers out of my arms and legs, my neck. I asked for no help. And as a disabled kid this was always the way of things. I remember the day a substitute teacher (who must have been all of 20) made fun of my blind eyes in an eighth grade math class. “Who are you looking at?” she said, with what today they call “snark”—and my “Lord of the Flies” classmates burst into laughter. I got up and fled the room. I sulked. All alone. I knew a good place in that school. In the bomb shelter. I wept among empty aluminum water cans with radiation logos stenciled on them. After that I reported the teacher. Sulking has power if you know when to quit. Achilles knew. I always looked for the bright pathway leading from sulking to skulking on to some noble end.